Have you ever considered using Sum & Difference monitoring techniques to enable you to reverse engineer some of your favourite records? We all know that developing our listening skill is crucial as engineers and producers who care about the quality of our craft. Utilising some commonly found features on mixing consoles and monitor controllers, today’s blog entry outlines some interesting ways to help expose elements in perspectives you may not have heard very often. So I am sure many of you have used mid/side techniques to record stereo signals, a technique that allows us to capture separate mid (cardioid most often) and side (figure-8) signals that can facilitate control over stereo content post-capture. In a mid/side array, the individual microphone feeds are combined in a simple matrix in order to produce and vary stereo content. The left channel is formed by the MID combined with the positive polarity of the SIDE, and the right channel is formed by combining the MID with the negative polarity of the SIDE microphone (mathematical expression below for anyone geeky!). Check out this useful blog post from our friends Universal Audio that explains recording in mid-side. 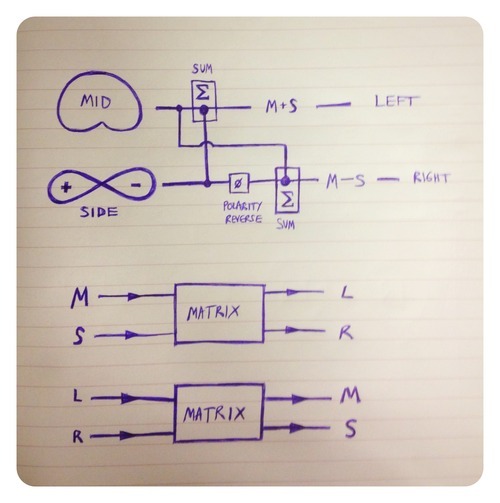 In case you may may have missed this elsewhere, a mid/side matrix is a bi-directional system. This means that if you put in M & S, you get stereo L & R out. 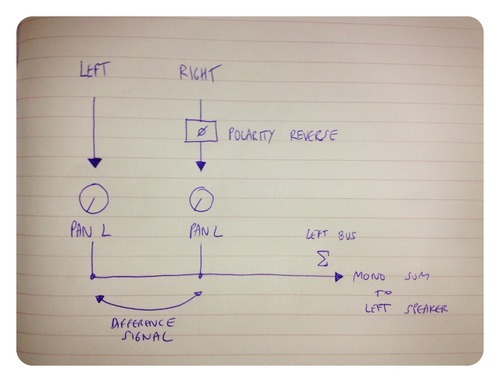 Reversing the matrix and sending L & R in, will in actual fact provide M & S outputs. Now this is not a new idea, even the classic Fairchild 670 had a built-in Sum and Difference matrix to provide dynamic range control over the mono and stereo components of stereo program material (for vinyl disk cutting). Here it was referred to as Lateral and Vertical mode. Mid/side can also be used for advanced stereo processing techniques that I may cover later, but for now let’s discuss its use as a listening technique. Actually, mono mixing has several advantages in terms of punch and impact to the listener - straight up the middle sounds direct and forward, and this is why we place kicks, snares and lead vocals here for example. Ensuring that your mixes have good impact in mono is most useful when you consider that club and festival PA systems are run in mono (mostly) to ensure that each listener gets the same experience no matter where they are stood… but I digress. Using M/S techniques it is possible for us to listen to our work in difference (side) mode - the stereo only content. This is the inverse picture - the stuff we would normally lose in a mono check. Listening in this way is a most excellent learning tool that allows you to isolate reverb choices, spatial delay work and often hear ‘into’ stacks of hard-panned guitars / vocals. 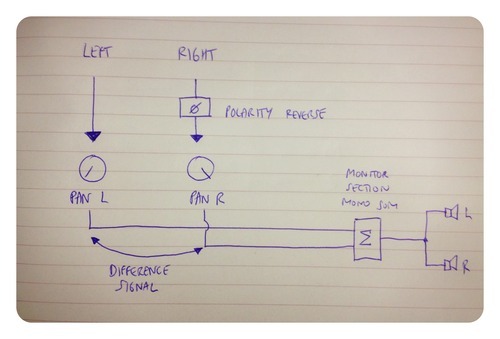 In order to listen in side / difference mode, you must polarity invert one side of your mix before summing to mono. This effectively creates a cancellation of the ‘in-phase’ mono components in your mix, leaving behind stereo only content. Use two channels on a console for this, or polarity invert one side of your mix in the DAW before summing to mono on a monitor controller or console master section like those on the ASP4816or ASP8024. If you are in ProTools / Logic etc you can split the mix to two tracks and invert one with the trim plugin and then route both to a mono output to one or both loudspeakers. Or you can listen in mono (difference signal) on both speakers as a phantom centre image. FAQ - Does my DAW Support Scroll Control?